Gable Lakes Peak lies just east of the Sierra Crest along a ridgeline connecting Mt. Tom to Four Gables Peak. For the second day in a row we were starting from the Pine Creek TH, although the trail would be completely different, one I'd never been on before that rises sharply from 7,400ft to 12,800ft in a little over five miles. Because it was expected to be one of the easier days, there was a large turnout - 15 for the photo session, about as large as we've seen for a mid-week Challenge day. The unmaintained trail starts from the left side of the parking lot, before the pack station. Because it doesn't get used by stock, it doesn't have the poop and heavy dust of the more popular Pine Creek Trail. Our hike up the trail would take several hours in the not unwelcomed shade cast by the massive bulk of Mt. Tom immediately to the east. The going was steep and we were happy to keep the sun at bay for those first two hours until we had reached the cooler air above 10,000ft. There is an old tram system rising to almost 12,000ft to the site of an abandoned tungsten mine on the west side of Mt. Tom. The steel cables and massive wooden towers have long stopped carrying equipment up and ore down the mountain, but their ruins remind us that this was once a busy mining district at the turn of the last century. Though a bit overgrown in a few spots, the trail is not hard to follow, and after an hour and a half we reached the first of several Gable Lakes. An old cabin is found here, with more ruins found higher up where an engine and water pump told of the technology used in mining ore from a nearby mineshaft. The trail ends here with another 1.5mi of cross-country travel remaining. Our group, having stretched out on the trail section, had four in the lead as we started the cross-country. In the front, Sean O led Michael G, JD and myself up the canyon past the highest of the Gable Lakes, following the drainage to take advantage of the better footing the grassy streamside sections offered. The last of these petered out with about 2/3mi remaining, the start of a traversing climb up the rock and boulders on the east side of the North Ridge. We stayed off the ridgeline for the most part to avoid the extra work that would entail, moving up through a slope filled with large boulders, eventually winding up on the ridge itself for the last 600ft of the climb. Secor makes no mention of this peak in his guidebook, so our beta was rather limited. The only reference I'd found was in Smatko's 1972 Mountaineer's Guide to the High Sierra, and that only mentions the class 2 route up the SW Ridge. Eric Su and Jonathan Mason had traversed the peak earlier in the year, reporting a somewhat dicey class 4 descent down a snow-filled chute on the NE side. We hoped to find something easier than this. The climb proved enjoyable, keeping to class 3 with care in route-finding for those last 600ft. The four of us reached the summit over the course of about 15min, having taken modest variations of the same route. We found a register at the summit dating to 1959 with a number of recognizable names, surprising given the obscurity of it - Heller, Smatko, Lilley, Beckey, MacLeod, Moynier, Selters, Croft and others. The views command some attention, taking in a large swath of the High Sierra with Mt. Tom to the east, Mt. Humpreys to the south, Four Gables to the southwest (with the full length of the Glacier Divide behind it), Merriam, Royce and Feather to the west, Mt. Morgan to the north. 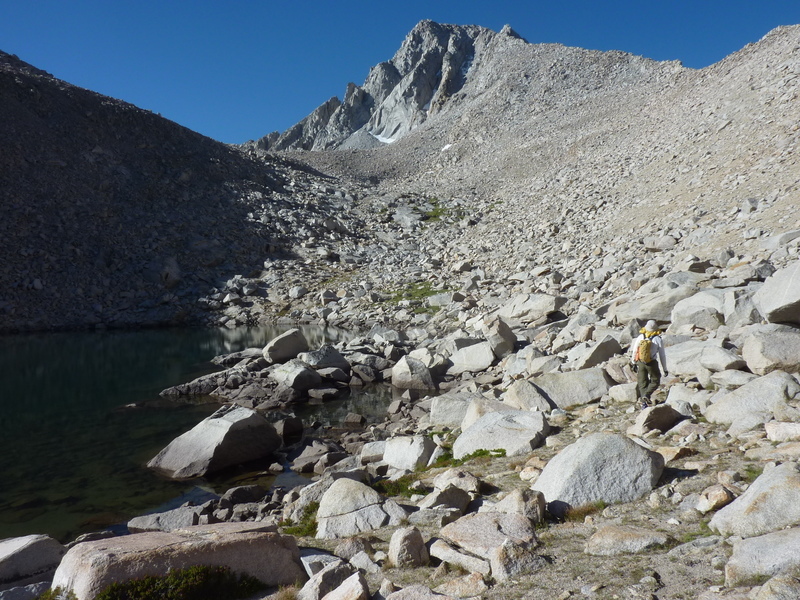 While at the summit for about 15min, we kept an eye out for a separate group that had started from the North Lake TH, going over Piute Pass and through Humphreys Basin to reach the peak. But we saw no sign of them or others heading to the summit from the north. Chris, Iris, Sean R. and Matt had picked this route to take advantage of the known class 2 route on the SW Ridge vs. the unknown and possibly summit-denying difficulties from the north. They would be out for more than 14hrs via this route (with Peak 12,801ft and Four Gables for bonuses), twice what it would take us from Pine Creek. Iris shaved a few hours off this by returning with others to the Pine Creek TH and getting a ride back to North Lake to retrieve her car. Upon setting off for the return, I thought it might be easier to head more directly down a steep, somewhat unstable chute to the northeast, avoiding the majority of the boulder-hopping we'd found on the east side of the North Ridge. Sean and Michael initially followed, but soon gave up on my efforts since it seemed to grow worse and the bottom section, out of view, might end badly in cliffs. I, too, eventually gave up this line of descent, though not before I had expended some energy climbing down to an impasse and then back up. I ended up losing track of the other two, though I did come across Scott Barnes somewhere in the boulder fields on his way to the summit. He was smiling and having as good a time as ever. He would go on to increase his lead for the Polka Dot Jersey by continuing on to climb Four Gables, Peak 12,801ft and then come back over Gable Lakes Peak to climb another bonus, Peak 12,260ft, closer to Mt. Tom, an effort that would keep him out for almost 13hrs. I continued to look for a way down the east side, eventually finding class 3 terrain down which I could manage to reach the base of the peak. As I neared the bottom I spied a pile of red stuff that had to be manmade. It eventually took on the look of a human, but disturbingly, it was prone and didn't seem to move. I hoped that it was some sort of forgotten cache rather than a dead body but found it to be neither - it was Michael C, resting amongst the rocks and Facebooking. This was his first day joining us and being unacclimatized, the altitude was affecting him. Laying down to rest, he'd found that he had cell signal in the upper part of this cirque and got lost in his online world amongst the granite boulders. My appearance seemed to have brought him out of his social media trance and he was soon up and continuing onto the summit, albeit slowly.